THE X FACTOR is returned to our TV screens and thus to the newspapers’ front page. And there is a story linking Katie Waissel to Simon Cowell and Sony BMG. You see, Katie is no enthusiastic amateur fluffing her lines and begging for one more chance to live her “dream”. Had she just got her song right first time over, Katie would have been less memorable. 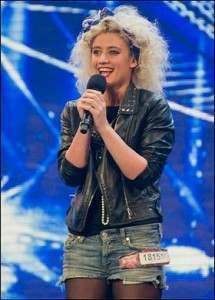 But she ‘fluffled’ it, and having begged for another chance, Cowell gave her “20 seconds”. That make-or-break time limit was extended when Katie started singing. As such, Katie ended up on stage and on camera longer than most. Why? Is it because she is in with the management at Sony BMG, where Simon Cowell also works? The 24-year-old from from Harewood, Hertfordshire, who looks like Kelly Osbourne channelling Vanessa Feltz, is also known as Lola Fontaine, singer of a jazz album and owner of a record deal in the US. But that’s not all. Green Eyed World follows the life adventure of Katie Vogel, a talented girl with a green guitar, killer tunes and big dreams. Each week, the new episode is your backstage pass into the music business as Katie travels through different cities and countries in search of fun, freedom, fans and friends. She’s also on nodding terms with Chaz Jankel, of Ian Duty and Blockheads repute. And she opened the bill at East 17’s comeback show at The Shepherds Bush Empire. Oh, and at a party in LA she met “DAVID MASSEY VP OF SONY BMG!”. Yeah, that’s the same Sony that Simon Cowell works for. I went to Dave Massey’s office a couple days later and spent the entire day there! We went through all my music, we jammed on the guitar, he introduced me to his team! And at the end of the day, he told me he wanted me to come back out and perform at a venue in NYC for him and Sony. My agent at the time who is at Creative Entertainment Group, called my management and told him of a tour that was happening around the UK. As soon as i heard i could hit the road, i jumped on board. Andy Abraham’s runner up in that years X Factor was going out a theatre [sic] tour across the UK. Sharon Osbourne came up to me after the Lodnon [sic] show and told me what a wonderful and powerful voice i had! That would be Sharon Osbourne, the former X Factor judge? Anyone else the girl billed on the X Factor as a “receptionist” knows?? That would be Dermot O’Leary who presents the….. X Factor. Joe Charrington from Sony BMG jumped back on the band wagon and introduced me to a wonderfully talented writer Ian Barter. Joe and Simon together decided that a female version of Coldplay indie rock sound would be best for me. So i visited Ian at his studio in Reading and we wrote a couple of tracks in this genre. However surprise surprise, Joe wasn’t happy. And so to the X Factor show in which Simon Cowell, of BMG records, sits on the judging panel. He’s introducing and judging an act apparently well known to Sony BMG. And the punters at home watch the telly show – which is less a talent show than an advertorial for new acts and friends of Sony and the X Factor.